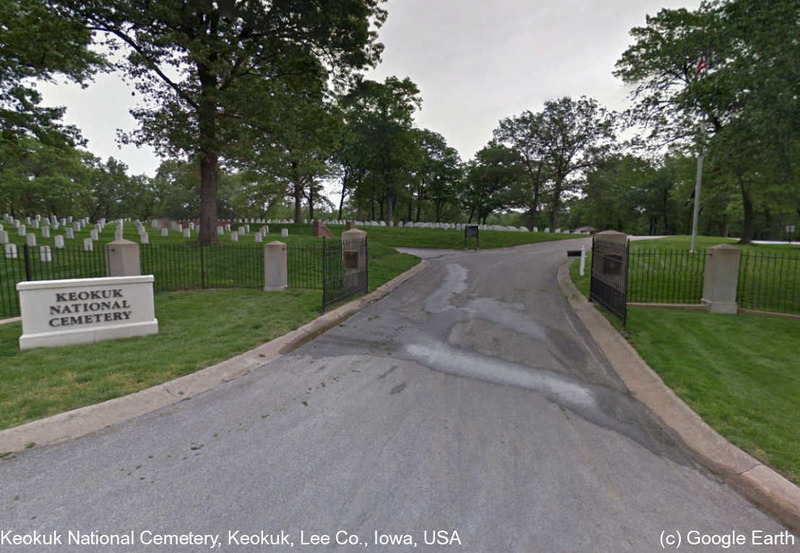 The 2.75-acre Keokuk National Cemetery, originally a part of Oakland Cemetery until Keokuk donated the land to the federal government in the mid 19th-century. According to an 1871 inspection report, there were 627 interments; 600 known Union soldiers and 27 unknown soldiers. Eight Confederate soldiers buried at the national cemetery, who died in Keokuk as prisoners of war. In 1908, when the frontier post of Fort Yates, N.D., was abandoned, the remains buried at that post cemetery were reinterred at Keokuk. Similarly, in 1948, 156 bodies removed from the post cemetery at Des Moines, Iowa, were reinterred here. Keokuk National Cemetery was placed on the National Register of Historic Places in 1997. The Unknown Soldiers monument, erected in 1912 by the Women's Corps of Keokuk, honors 48 unknown soldiers buried here. The monument is a large granite obelisk topped with the figure of a Confederate soldier standing at parade rest. Office Hours: Monday thru Friday 7:30 a.m. to 4:00 p.m. Closed federal holidays except Memorial Day and Veterans Day. Visitation Hours: Open daily from dawn to dusk. The Rock Island National Cemetery in Rock Island, Ill., performs all administrative functions for Keokuk National Cemetery. (Ref: Information from U.S. Department of Veterans Affairs).